Not only are you a first rate loomer, but a cook and IT kid. I'm sure your Mom was thrilled! Thank you, Ms. A. She was. I can cook anything that can be microwaved. Thank you. I hope she likes my tips. She can ask me any questions she wants to and I will help her. Thank you, Mr. Miller. I have some tie dye bands that are also very cool. They got banned from our school but I still got good at it. The sparkle bands are awesome. I have some. I also like the metallics. Did you see the books on Amazon for kids? 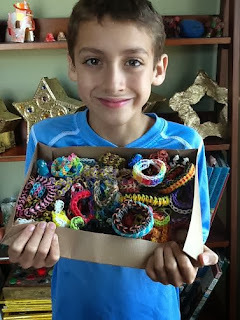 I want The Loomatics Guide to the Rainbow Loom. You have quite a box of bracelets there. My friend's 62 year old husband is obsessed with looming bracelets. Looks like you have a lot of years of bracelet making "looming" ahead of you. Wow. I never knew someone old who liked Rainbow Loom. But I think that's quite nice. Bracelet making, Looming is a positive. You are a rainbow loom rockstar!!!! Do you happen to know how to put the charms on? Dear Ms. Andrea: I do. I have done it a lot. If you have a charm made out of rubber bands that's different from a charm made out of clips. The charms with clips is easier. To do those, You just open up the clip and put it on a band in the single. And if you do it with rubber bands you put the long loop made on the end of the charm and you put it on one of the pegs on the single and you loop it on with the band and it becomes attached. This is Auggie. Do you want me to post a tutorial on FB? I will do it tomorrow. On my mom's account. Bye. What if you make a ring of hibiscus, to form a large bracelet, instead of just one boring one? Just to make it more interesting. Thank you for the great tips, Auggie! Oh wow, what great tips. I think we are going to need your help soon. My kids are only six and I just found out our friend is mailing them each a rainbow loom. Hopefully they can learn how to do a few of the basic bracelets. I'll have to come back to this post when they get started. Thank you! I'm going to show this to Moochie. She's been slacking lately but I just surprised her with some bands (official ones, taking your expert advice because I'm no fool) and tomorrow I'll show her your posts, so maybe she'll get back to cranking out the bracelets. Hope so, because her dad and I like to wear them, but they keep breaking on us.